This scene brought to mind the opening line in Gabriel Garcia Marquez’ “One Hundred Years of Solitude”, where the author remembers going “to discover ice”. Here, the discovery is water. Of course, the coyote knows water — he drinks it all the time, but here he seems to discover something about it beyond its thirst-quenching capabilities or its wetness. For one, the large puddle suddenly appeared where there hadn’t been one only the day before: THAT was something to investigate. The youngster, a six-month old, curiously tests and discovers its qualities as an object and a phenomenon. He touches its surface several times: it sends out waves when he does so, he can step through it even though it looks solid, he can see reflections (might he see himself? ), it splashes, he can lift a little on his paw before it falls apart and off his paw, he can feel it and it “responds” but doesn’t hurt him, and of course he can drink it, and it’s wet and cold. The natural world is endlessly fascinating, isn’t it! I was able to capture some still shots when this occurred, which you see above. The video, which I switched to at the very end, captures only the last few seconds of the coyote’s charming investigation. Sadly, trapping continues big time in vast areas of the country in the name of “management”. This policy produces harm and heartache for the animals and for those of us who care about them. It’s not management, it’s animal abuse and it’s shameful — an immense contradiction for the human species which considers itself the custodians of our planet. Let’s practice the values we believe in. Real “management” involves simple education. Let’s get information out to folks to help turn the tide. This posting is towards that end. The letter I wrote in a comment below has information for people who don’t know that trapping has only negative consequences. Even those people who love coyotes often believe relocation is best for the coyote and the humane thing to do — they are innocent of the truth. We need to let them know the truth, and at the same time let them know that precautions to make coexistence work are indeed simple. Facts prove that coyotes are not dangerous to humans: they avoid humans. Pets can easily be protected by following simple guidelines. Unbeknownst to many, trapping ALWAYS leads to killing (see letter in comment below). Please #resist those instigating trap and kill policies. Please help get educational materials out to everyone — we all have a stake in this. Call your supervisors, homeowner associations, social media and neighbors: let them know what you think about outmoded trap/kill policies and give them current educational materials. 1) Keep your distance always from all wildlife and don’t approach — the more distance, the better. 2) Allowing cats to roam free puts them in danger from dogs, cars, raccoons, coyotes and more. Coyotes don’t know who is a pet and who isn’t: how would they know the difference between a cat and any other prey? 3) Always remain vigilant while walking your pet. 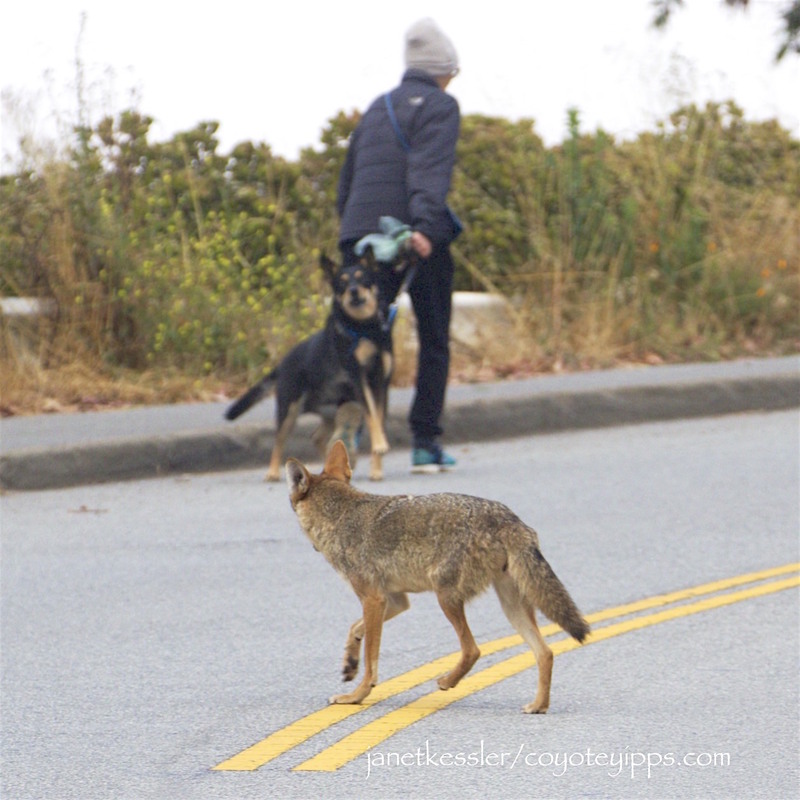 If you see a coyote, at any distance, while out with your dog: leash right away, shorten your leash, and walk the other way. See “How to Handle A Coyote Encounter”, below. 1) “Coyotes as Neighbors, what to know and do”, an introductory video presentation. [Also in Spanish, Mandarin, shortened English version]. 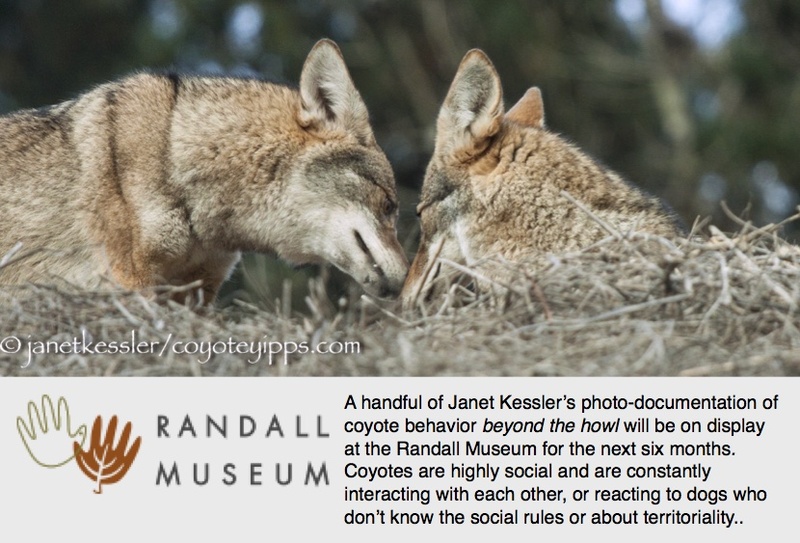 2) “How to Handle A Coyote Encounter”, a downloadable, concise and informative flyer. More coexistence guides can be found on the coyotecoexistence.com website. 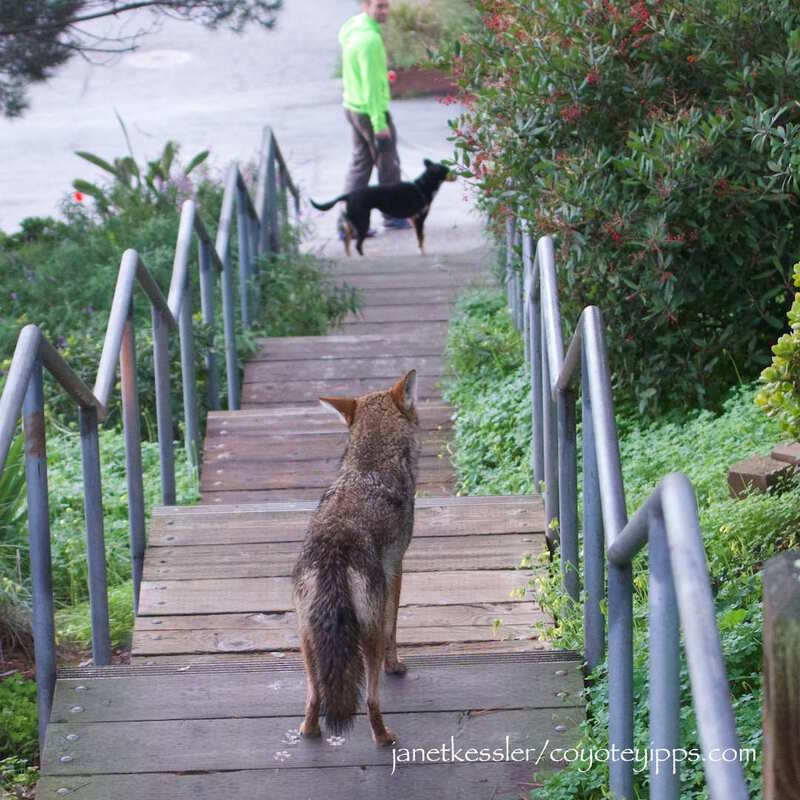 3) Inside A Coyote Family, an article which appeared in WildCare Magazine about coyote family life. More about coyote behavior and family life can be found on coyoteyipps.com. See letter by Yipps in the comments for a sample letter you could write about why trapping is inhumane and doesn’t work.